Given the stuff on TV at the time, and especially conditioned by the dreck on which I’d been working for the past few years, I really didn’t expect much. But, alone in that room, within a few minutes I was convinced that finally, here was a show I could be as enthusiastic about as I was for my own series concepts. The new series, developed by Peter Fischer and the remarkably talented William Link and Richard Levinson, was Murder, She Wrote. I couldn’t be more excited to be talking to (the real) Tom Sawyer about his writing career, which spans not only two political thrillers and a lively PI series, but television stints on some of my favorite shows — including both The Law and Harry McGraw and the iconic Murder, She Wrote. 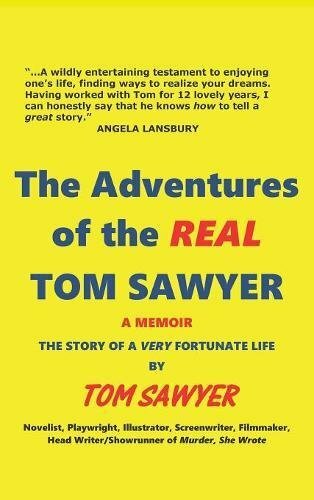 The stories he tells in the interview are only a taste of the insider stories he shares in his new memoir, The Adventures of the REAL Tom Sawyer. In addition to chatting about his Hollywood career working with Angela Lansbury, Jerry Orbach and Tony Curtis, among many others, Tom gives a shout out to The Maltese Falcon — and a great story about the influence it had on Murder, She Wrote. We also discussed his books on writing (Fiction Writing Demystified), as well as his thrillers, The Sixteenth Man and No Place to Run. And I was happy to learn that he’s writing a follow-up to Cross Purposes, which launched his Barney Moon, PI series. 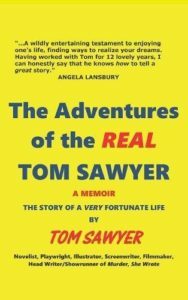 But as Tom’s memoir, The Adventures of the REAL Tom Sawyer, makes clear, he’s done more than we could ever talk about in one twenty-minute interview, including a musical about JFK (Jack); a film which he wrote, directed, and produced (Alice Goodbody); and a book about what it takes to succeed (9 Badass Secrets for Putting Yourself in Luck’s Way). To learn more about these and his many other projects, check out Tom’s website, ThomasBSawyer.com. Tom graciously sent me an autographed copy of a Murder, She Wrote which he’d written, and at the end of May, 2017, I will be giving it away to one lucky person on my mailing list. So if you’re not on my mailing list yet, now is definitely the time to sign up. I send out one newsletter a month, and I never share your e-mail with anyone else. So sign up now, in the box on the top right. Good luck! Laura Brennan: Tom Sawyer has written for the stage, television, movies and mystery novels, and his memoir, The Adventures of the REAL Tom Sawyer, launches today, May 1st. While his adventures — and accomplishments — are legion, two are of particular interest to Destination Mystery listeners: first, his crime novels, which range from thrillers to a PI series; and second, his involvement with none other than Jessica Fletcher, as a writer, producer and showrunner on Murder She Wrote. Tom, thank you for joining me. Tom Sawyer: Well, thank you for having me, Laura. LB: You have had a career writing for just about every possible medium, and now you’ve turned your hand to memoir. And your adventures are just amazing. TS: Well, thank you. They amazed me as I had to revisit them to write the memoir. It was one holy moly moment after another because at the time that these extraordinary things were happening in my life, with most of them, I had no perspective. I just figured, oh, this is how it works. Next. LB: You have done some amazing things. Let me see where I even want to start. I think, you working in New York as a visual artist. TS: Well, that was my boyhood ambition. Back when I was a kid, they did story comic strips. Realistically drawn, three panels a day with dialogue balloons. The idea, of course, was to sell newspapers, to get the readers to want to buy the newspapers so they can find out what happens next in your comic strip. And that became my goal from the time I was 12 years old. Went to New York when I was 20 and started working in comic books. LB: The interesting thing to me was that although you’re working as an artist, in the art room where you worked, what you’re actually learning how to do is hone a joke. TS: That was true, and again it was an example of something I didn’t come to appreciate until much later when I had moved on to Hollywood. I began writing for television and I was certain they were going to catch on at any moment that I was faking it. Well, it turned out that I knew more than I thought I did about storytelling. And the reason was that in this studio which I shared on 57th Street in Manhattan with a bunch of other artists and a writer or two, was that we would carry on conversations every day while we were working. Someone would come in with a new joke that they had just heard and for the next hour or two hours sometimes, we would idly punch it up. We would say, well, what if you put this sentence in front of that one? Or this anecdote in front of that one? And without realizing it, Laura, I was learning how to tell stories. Because if you can tell a joke well, that is story structure. LB: One of your hallmarks through life has been jumping in and creating stuff. You needed a better portfolio, you jumped in and created a more professional portfolio for your art. You wanted to direct a movie, funding fell out, you jumped in and you made that movie. LB: And speaking of “killing to succeed,” how did you get onto Murder, She Wrote? TS: Well, that was total luck. When Murder, She Wrote was starting, was created by Peter Fischer, with the help of Bill Link and Bob Levinson, my agent submitted a pilot that I had written for CBS recently, before that, which was not a mystery. It was a World War II pilot which never got made, but it got me a lot of work because of the script. And in this case, Peter Fischer saw something in my scriptwriting and invited me in and said he’d like me to — this is before the show went on the air — he’d like me to write for it. Now, what blows my mind even to this day, Peter knew exactly what I was saying. He understood the shorthand of it, which was the Maltese Falcon, what set it apart from mystery stories — and it became the seminal modern detective story, and still is — was, it was not about clues or suspects. It was a story about a bunch of interesting characters who were in conflict with each other, in this case to try to get their hands on the blackbird. Yes, there were a couple of murders in it, but you almost didn’t care who did the murders because you were so fascinated by those people. And that became the format for the show. LB: I wanted to talk about that because in fact, Murder, She Wrote is not watched for the plot. It’s all about how much we love Jessica Fletcher. TS: Absolutely. She was the great glue for the show. Once I started writing for it, by the way, I quickly became frustrated because I kept looking at her movies and her range as an actress is, and always was, spectacular. And we were using one tiny little part of it for Jessica Fletcher. She had no real emotional involvement in the story itself. And so I contrived and it became a style for the show that we would try to put in at least one moment in every episode where someone said to Jessica Fletcher, “Mrs. Fletcher, I don’t have time for this. Get out of my office, I’m busy.” Or words to that effect. And Angela would get her back up. And the whole show would come to life because of that animation. LB: She’s a phenomenal actress. I love her in everything. LB: Yeah, she’s incredible. You tell an awful lot of wonderful stories in your book about the different people that you worked with, particularly — I’m not going to spoil it here, people can read it in the book — but the Buddy Hackett story is just fantastic. LB: And also Mickey Rooney and all these wonderful people that you got a chance to work with because of the show. Do you have a favorite story about Angela Lansbury that you could share? TS: Well, that Buddy Hackett stories almost my favorite. But there’s one story about the show which your listeners and fans might find interesting. She was not the first choice for Jessica Fletcher. LB: That is incredible to me. TS: The actress who played Archie Bunker’s wife was the first actress they offered it to. And she turned it down. At which point they turned to Angela Lansbury as a second choice. Angie said, “Well, I’d love to do the show but,” she said, “I have to check with Andrew Lloyd Webber because he’s writing a show for me. I don’t know when it will be ready.” So she consulted with Lloyd Webber, and he said, “Go ahead and do it. I’m running a couple of years behind and the chances are your series won’t last that long anyway.” So she took the job. The show he was writing for Angela Lansbury was a musical version of the classic movie Sunset Boulevard, which featured this elderly silent film actress by the name of Norma Desmond. He had already written some songs for her, for the show. The musical that he had to finish first was Cats. And the story goes that when he finished it, they took a hard look at it and realized that it had no memorable songs in it. So he took one of the songs that he had written for Angela Lansbury, as Norma Desmond, to sing in Sunset Boulevard. It is the only song from Cats that anyone remembers. It’s called Memories. And it had nothing to do with the show or the story in Cats. But can you imagine, in the musical version of Sunset Boulevard, Angela Lansbury going down the grand staircase at the end of Sunset Boulevard singing Memories? It takes your breath away, the thought of it. LB: Oh, that would have been spectacular! The thing about Murder, She Wrote is that it’s almost a perfect cozy. When you decided to write a novel, you did not write a cozy. TS: No. 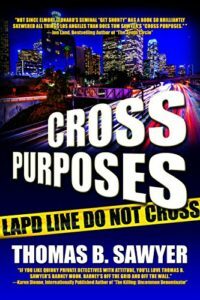 I have been thinking about taking a crack at novels for a long time and I chose instead to write what amounted to a political thriller. I was always fascinated by the Kennedy assassination and never believed the story as it has been written. So I wanted to write a fictional story in which we would deal with what I consider really happened. It became The Sixteenth Man. It was quite a challenge because one of the differences in writing novels from writing for the screen is that you live for a longer period and more intimately with your characters. LB: You also have written books about how to write. TS: Yes. One in particular, Fiction Writing Demystified, which is still used as part of the curriculum in a lot of writing courses I’m flattered to say. It’s a nuts and bolts, no theory, all practical course in writing. I was astonished when I got into television how, contrary to other businesses that I had heard of, people didn’t guard their secrets. They didn’t guard what they knew, especially the writers who were running TV series. These were hard-nosed pros who had to turn out in those days 22 episodes a year and they needed all the help they could get from the freelance writer. And the help that I got from those guys was phenomenal because it was just, there was no Iowa school of writing literary theory about it, it was do this, don’t do that. It was just a great course in writing, and I tried to incorporate that into my book, Fiction Writing Demystified. 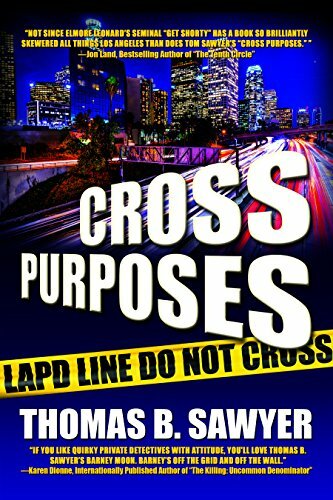 LB: Let’s talk a little bit about Cross Purposes, which is your Barney Moon, PI novel. So Barney Moon was inspired by someone you came up with while you were still writing for television. TS: That’s right. One day, a producer friend of mine and I, who used to come up with ideas for series, we were having lunch one day and he said to me, “You know the trend is that we need to write stuff that has lower budgets, that doesn’t for instance have to rent standing sets on soundstages and pay for studio space and what have you. That could, say, all be shot on location.” Well, over lunch, we came up with the concept of Barney Moon, a New York private eye who regards Los Angeles as an alien planet and he stuck here, in LA. And he doesn’t drive, so he’s got a driver, a beautiful young woman. And I said, “I wonder who we could get to play Barney Moon?” We kicked a few actors names back and forth, I don’t know which of us came up with Tony Curtis, but this guy, my partner, had been the head of CBS and had been the head of MGM at one time, his name was Jim Aubrey, and I don’t know which of us came up with Tony Curtis but I said, “God, it would be great if we could run this past him and see if he’s interested before we try to sell it.” Because he was a major star. And Jim, who knew everybody in the business, said, “I’ll call him.” In those days before cell phones, he takes me to the payphone in this restaurant and he calls Tony Curtis. And of course Tony takes his call. He puts me on, and I pitch the idea to Tony Curtis over the phone, never having met him or spoken to him before. And he says, “Great! I love it. I’ll do it.” Tony actually went to the pitch meetings with us — bringing your star like that was amazing. He dressed in a rumpled white linen suit, and of course the first place we pitched it to, an independent house, bought it. We were ready to go. And then I found out that my partner had some gambling problems and the mob was after his kneecaps or worse, so I had to kill the series. But the idea stuck with me and that’s how Barney Moon, long-windedly, that’s how Barney Moon was invented. LB: Oh, no, it’s a wonderful story. Well, your memoir is filled with stories like that, just wonderful stories about Hollywood and your life. What is next for you? TS: finishing a second Barney Moon novel, and I’m going to tackle something that has intimidated me all my life: short stories. I am in awe of the great short story writers, Somerset Maugham, John O’Hara, Irwin Shaw, to the point where I never tried it because I just assumed that I could never do that. And it may be that I can’t. But I need a challenge. And having written now four novels, while I haven’t mastered the art, my comfort zone, Laura, is not being certain I can pull the next thing off. So that’s going to be my next project. LB: Well, I would be remiss if I didn’t ask you about The Law and Harry McGraw. TS: Well, it was again, another privilege to work with Jerry Orbach and, in this case, Barbara Babcock. It was a spinoff from Murder, She Wrote. Harry McGraw had been, he’s a Boston private eye, and he had been sort of a guest costar on Murder, She Wrote for a number of years playing Harry McGraw, this private eye with whom Jessica got involved in various stories. Jerry and I became good friends during the course of that. We’d go to the Raiders games and stuff like that, he’d come to my parties. He was just a marvelous, personable, incredibly talented guy. And so when we decided to do a spinoff, I got to be the showrunner/producer of that. Unfortunately, it only lasted a year, but I had a blast doing it and working closely with Jerry. It was just a total privilege. LB: If people want to keep up with you in all your work, how can they find you online? LB: Fantastic, and I will link to that in the show notes. Finally, to bring it back to your memoir, everyone would love this book, and your philosophy in it is just boundless energy and joy. Have a great life! So, not everyone can be fortunate enough to marry your wife, Holly, to whom you give a lot of credit. So, other than being lucky enough to marry Holly, what advice would you give people listening? TS: The best advice I can offer is, put yourself in luck’s way. Put yourself where luck can happen to you. And that means, especially these days of the Internet and sitting in a room all by yourself, get out and meet people face-to-face. Back when I was actively doing it, we didn’t call it networking, but that’s what it is. And it — networking changed my life, both in New York and later, much later, in Hollywood on a much more dramatic level, it changed my life because it was what enabled me to get started. In those days we did parties, we went out to dinner with people, we threw dinners. And that kind of socializing, that’s how you meet the players in the business. One of the strange phenomena — and then I’ll stop this — is that back then, if you got invited to a party, even if you weren’t already in the business, because you were there, you were accepted as one of them. Their doors were open to you. You could phone them with an idea. You could take them to lunch, pick their brain. And that, that is so much what has contributed to the fun life that I’ve had. LB: Thank you, Tom, so much for joining me today. TS: Thank you for having me, Laura. It was a great interview.